Enhanced ADI based on the look and feel of the EADI's used in Airbus A320-A330 aircraft. Displays moving speed tape, and current airspeed window, a speed trand vector, and optional V-speeds (set via the FMS). A speed bug symbol is displayed when in range of the speed tape. When out of tape range a digital speed bug is displayed. Displays moving altitude tape, and current altitude window, an altitude bug symbol is displayed when in range of the altitude tape. When not in range of the tape a digital altitude bug is displayed. Displays a sliding heading tape at the bottom, a heading bug symbol is displayed when in range of the tape. When not in range of the tape a digital heading bug is displayed. A green current track symbol is displayed over the tape. Displays current vertical speed via a green vector line. 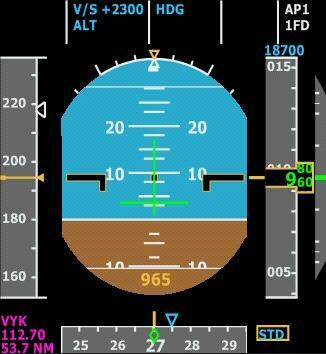 A small digital vert speed window is also displayednear the vector line (in hundreds). Displays current autopilot or FMS Flight Modes. Displays current Localizer scale when the tuned Nav1 radio is a Localzier. A glideslope scale is displayed when the tuned Nav1 radio has a glideslope. Displays the ident, freq, and dme of currently tuned Nav radio.